T-Mobile has long been known for, uh, stretching the definition of unlimited data here in the US with its soft data caps. But today, T-Mobile is officially launching its new unlimited data plan. The difference? It's actually unlimited, unlike the other unlimited data plans T-Mobile still offers. Making sense yet? The catch is that the new Unlimited Nationwide 4G doesn't come with mobile hotspot service. So, no Wi-Fi tethering unless you want a soft data cap. 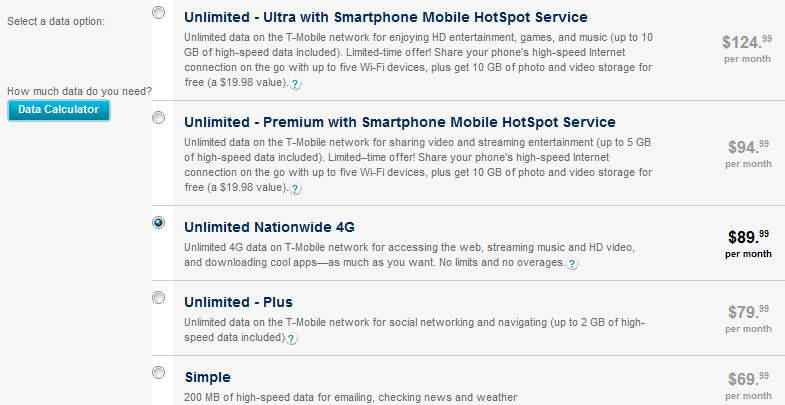 For $5 more a month you gain the hotspot feature, but are capped at 5GB of "high-speed" data. Which, for most people, is probably plenty. For $10 less a month than you're seeing in the above image, though, you can get a 500 minute plan with these same data packages, and keep unlimited text. 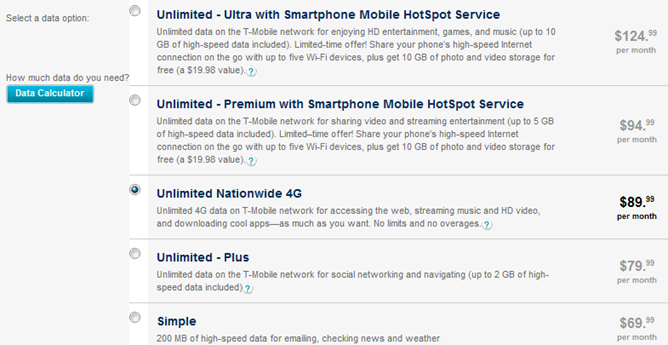 So, the lowest price T-Mobile will give you truly unlimited 4G data, text, and 500 minutes is $80 a month - on contract. Off contract, though. You have even more options. At the cheapest, if you buy a phone off contract (or bring you own device), T-Mobile is willing to sell you a 500 minute "Value Package" with pay-per-use texting and the Unlimited Nationwide 4G plan for $55 a month. Confused yet? Look at this page. And the fun doesn't stop there - to celebrate the launch of its new super-actually-unlimited plan, T-Mobile is now including the HTC One S (and some other, undisclosed "4G smartphones") in its monthly equipment repayment program. That means you can go buy a One S for $50 ($0 after a mail-in rebate, ugh), and then pay $20 a month on top of the cost of your plan for 20 months as part of your two-year contract. But the One S is only $150 after the MIR on a new two-year agreement, so you'd actually end up paying more by paying less. I'm going to go take some aspirin now.